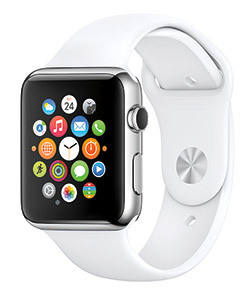 Like many other people, I’ve been eagerly awaiting the arrival of the Apple Watch. It hasn’t really arrived yet, you understand, but you can at least now see it, play with it, and plonk down large amounts of money for it, in anticipation of delivery in a month or two’s time. I spent quite a lot of time experimenting with it at the Apple store yesterday. I must admit to being something of a watch techno-enthusiast. Back in about 1976, my brother and I were the first kids in my school to have a digital watch, and they, too, were made by a computer company, Commodore. 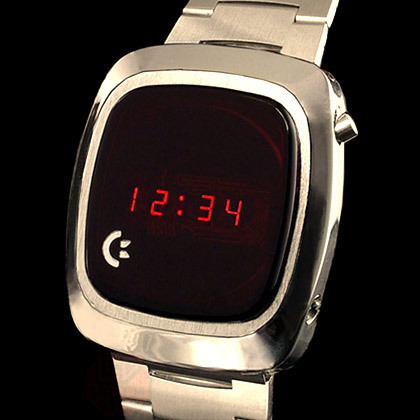 The company went on to create computers like the Commodore PET and the 64, but, unlike Apple, it made a watch before it did computers. 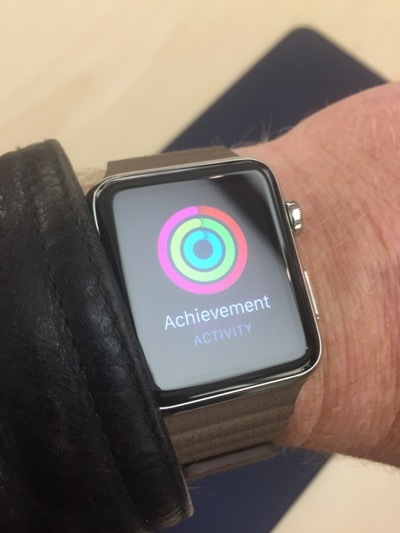 Still, amusingly, it probably looked more like an Apple watch than any timepiece I’ve owned since, because the display used too much power to keep it constantly illuminated; the LEDs only lit up when you pressed the button. I still remember the excitement of staying awake outrageously beyond my bedtime, just so I could see the display change from 23:59 to 0:00. We bought our first digital watches on a discount offer. I think they were £13 each. 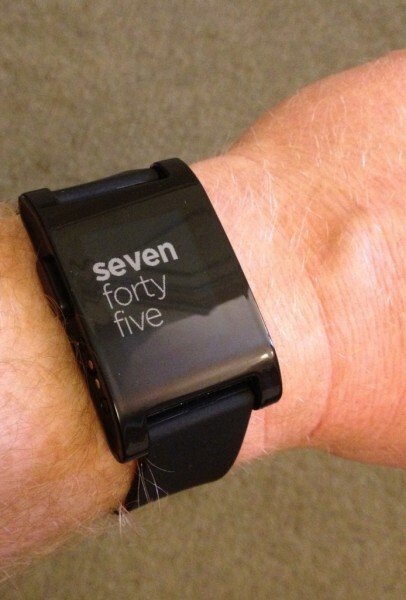 Roll forward about a third of a century, and I was an early backer of the Pebble project on Kickstarter. I’ve worn it every day since it arrived, and I even created my own watchface for it. It’s been fun, but it’s taken the developers a couple of years to get to the point where notifications are reasonably reliable and the API is easy to use. Many people who bought Pebbles sold them soon afterwards on eBay. However, the team deserve a lot of credit, I think, for kickstarting (somewhat literally) the whole smartwatch revolution: few people thought watches were really in demand any more until they proved, rather dramatically, to the contrary, by being the biggest Kickstarter project ever. The upcoming Pebble Time looks nice, too, and it’s worth pointing out that you’ll be able to buy it for about the same price as some of the standard straps for the Apple watches. I think it could be a good option if you want to explore this whole smartwatch thing, especially if you don’t own a recent iPhone (on which the Apple Watch depends). The Pebble, despite its quirks, has taught me some interesting things. One is that the wrist is a very convenient place for a user interface. Avoiding the need to take my phone out of my pocket is a great benefit; I can dismiss incoming calls in a couple of seconds, for example, if they occur in the middle of a meeting – much less disruptive. About a year ago, I did it without thinking in the middle of giving a talk, and almost got a round of applause from the audience! Another is that I use my Pebble many times a day, but very few of those are actually about telling the time. Watches were important for that purpose in the past, when you had to keep checking them to know whether you were getting close to your next appointment. But I’ve long since relied on my devices to notify me in advance of any upcoming events, and I spend much of my time sitting in front of a screen with a clock in the top right corner, or driving a car with a clock on the dashboard. Actually looking at a watch to discover the time is probably something I do about once every other day. So, yes, I’m about to buy my most expensive timepiece ever, when I’ve discovered that I don’t really need a watch for telling the time any more. Actually, to my surprise, my number one use of the Pebble has been to stop and start audio. I’ve described in a previous post how I listen to large numbers of audiobooks and podcasts, and I seldom do this through headphones. Being able to pause a book from the other side of the kitchen just before I start the noisy coffee grinder is exceedingly handy. Being able to do so with a couple of button presses when I’m out walking the dog in mid-winter and wearing gloves is even more so. While driving, I’ll often stop and start music this way, because reaching my wrist is more convenient than reaching the controls on my dashboard, and so on. This bit of my Pebble’s operation has always been very reliable, perhaps because it’s operating simply as if it were the pause button on a traditional Bluetooth headset. As with every device, in my experience, it’s when you start doing complex Bluetooth LE stuff dependent on background apps that reliability becomes an issue. Now, I don’t expect audio control to be quite so easy with the Apple Watch, since there is no single, eyes-free sequence of physical button presses that will do it. Using the screen won’t be so easy with gloves on, either. On the other hand, you can just lift up your watch and say ‘Hey, Siri – pause!’ But the key point is not that audio control is the reason to buy a smart watch – it’s that you won’t know what you’ll use it for until you get one. I know now that having controls and a screen on my wrist is a valuable thing, and that’s why I’m buying an Apple Watch, and would do so even if it didn’t offer telling the time as one of its functions! I quickly jumped over to my local Apple Store’s site and booked a try-on appointment, then headed into town. There was actually much less chaos in the store then I’d expected, perhaps because it was a Friday morning and most of the honest hard-working people of Cambridge had real jobs to go to. So I got to spend nearly an hour trying on different straps and watches, and playing with the software. First, the watch is beautifully made. This is no surprise from Apple, and you’d expect it for the price, but I was still struck by it. It feels slimmer on the wrist than the somewhat bulky impression given by the photos. The display is amazing – clear, high-contrast, easily readable: it makes the Pebble look very limited in that respect, though I haven’t tried it in bright sunlight. Reading even a normal text message on the old Pebble is a bit trying, but scrolling through longish emails on the Apple was just fine. And I’m now at the stage where I normally need to put on reading glasses for things at that kind of distance, so the fact I found it worked well without them even when displaying things like maps is a real testament to its clarity. And hey, displaying maps on your watch, with a little dot showing where you are! How James Bond is that? The ‘digital crown’ works surprisingly well for scrolling. I was skeptical after seeing the videos, but it is very nice, at least for right-handers. The straps are also works of art. Or, at least, works of exceedingly good design combined with excellent manufacture. Some of the prices are outrageous, though: take a look at the link bracelet above, for example. It looks a lot like the straps I’ve had on a couple of previous watches, and it costs £379. Yes, you read that correctly, and no, that doesn’t include the watch. I thought it was a typo when I first saw it on the Apple site. Only when you try it on, do you realise why that price is not quite as outrageous as it first appears. It’s unbelievably slim – much thinner than the photos suggest. The machining is superb. Each link in the bracelet has a clever little catch so you can remove or add them without the need for tools. And the clasp mechanism works beautifully. It apparently takes nine weeks to make. It’s still outrageous, though. I didn’t get one of those. 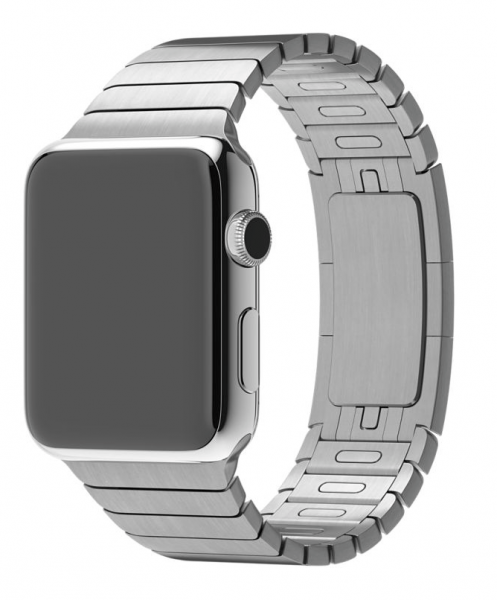 If I were starting now, I think I would buy the black aluminium ‘Sport’ one – it looks better than the silver equivalent, but only if you wear it with a black strap. This limits the options, but combining it with a black leather loop strap would be a fine combination. I didn’t go for that, in the end, because it wasn’t one of my early orders and if I switched I would have to wait another month, but for geeky guys who are less impatient than me, it might be a good choice. The silver aluminium, I thought, looked best with the blue leather loop. A third-party site, mixyourwatch.com, will let you explore the combinations to your heart’s content, and the Click project on Kickstarter should let you use more affordable, non-Apple straps. The icons on the home screen are a bit tricky to hit unless you have more delicate fingers than mine. Not as bad as I was expecting, but I still don’t think it would work very well while I was cycling. You can zoom in using the crown, but I imagine most common apps will be accessed more through swipe-upward gestures than though this screen. The user interface is not really intuitive, I found. But that’s not too surprising, because we’ve no experience of a device with so much functionality in such a small space and with so few physical controls. It’s hard to know where intuition would actually come from. The temptation is to think of it like an iPhone with a home button or a browser with a back button, and it’s not quite either of these. I think it needed a new model of interaction, though, and it will be easy to learn once you’ve played with it for a while. A pleasant surprise, for me, was just how well Siri worked, using the watch as a microphone. This was in a busy and noisy Apple store, yet it was almost flawless. (Note, too, that I didn’t get the opportunity to pair the watch with my phone: the watch has wifi, and Siri is one of the features that works even without the phone being present.) I’m particularly keen on this because I’ve often wanted to use Siri while driving, yet it’s almost impossible through my car’s bluetooth kit. I’m hoping the watch will be a much better way to do this. All in all, I came away very impressed, and pleased at having got my order in early. The price will be a real issue for many people, and even for enthusiasts like me who might be willing to spend more on a watch that will last for some time – my old Citizen served me very nicely for 13 years before I got the Pebble – this one comes with a big question mark over it: how long will it be before I want to upgrade it? In the end, though, I paid the money, because I think this will probably last me longer than a phone, should have a good resale value if I want to sell it, and I’m hoping at least that things like straps will be interchangeable with future versions. (If comparing it with the cost of a phone, of course, you need to work out the true cost of the phone once all the months of contract are included, which typically adds a few hundred quid to the label price – there’s no such subsidy for a watch. And your phone doesn’t measure your heartbeat!) But mostly, I bought it because I’ve discovered how much I value having a user interface to my technology on my wrist, and this is, without a doubt, the best available. Update: John Naughton pointed me at this splendid Alex cartoon.